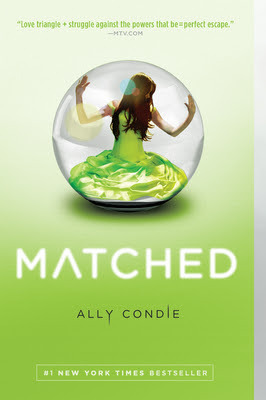 Matched was written by Ally Condie. It is book 1 of a trilogy. I read Matched as part of the BlogHer Book Club. When I received Matched I checked out the cover (I found it really beautiful in it's simplicity). The back cover and first few pages of Matched shares multiple reviews comparing it to The Hunger Games. While seeing this kind of excited me (because I LOVED Hunger Games) it also had me really wary of reading it at all (because I LOVED Hunger Games). I found myself thinking "if this is as amazing as the reviews make it sound I can not wait to read this" while at the same time I was thinking "there is just no way this book is going to be nearly as good as they're trying to make it out to be." So... I put the book down. I put it down and barely glanced at it for weeks. (Have you ever done that? Been unable to start a book because you want it to be really good but you're afraid it's going to be awful? Just me?) I finally decided I had to just get to it. "I think it’s different in that it’s perhaps less action-oriented and more introspective. This is really the story of one girl, Cassia, learning to choose." I can't wait to see where her choices take her in the next book.